For the pears: Combine the water, sugar, lemon juice, cinnamon stick, vanilla, and salt in a saucepan large enough to hold all the pears and bring to a simmer over medium-high heat. 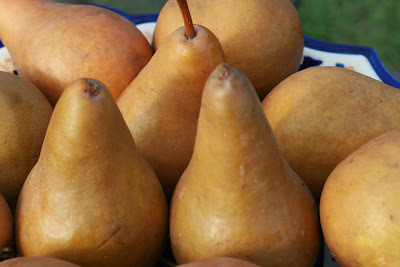 Meanwhile, cut the pears in half, remove the seed core and fibrous cores at either end, then peel the pears. For the tart shell: Put the flour, confectioner's sugar, and salt in a food processor and pulse a few times to combine. Add the pieces of cold butter and pulse until the butter is cut into pea-sized pieces. Add the egg yolk and combine in several pulses until the dough starts to turn from dry to clumpy. Do not let the dough form one giant ball or it will be be overworked - just keep checking after every pulse and when the dough pieces looks like they will stick when you press them together, stop. Butter an 11-in tart tin with removable bottom. Turn the dough out into the tin and press into the bottom and up the sides with your fingers. You probably will not need all the dough - save the extra for patching the shell after you bake it. Do not press the dough too hard or it will become tough - just enough for it to form to the tin. For the Frangipane: Combine the butter and sugar in the food processor and combine until smooth. Add the ground almonds and blend together. Add the flour and cornstarch, and then the egg and egg white. Process the mixture until it is very smooth. Add in the vanilla and almond extracts just to blend. 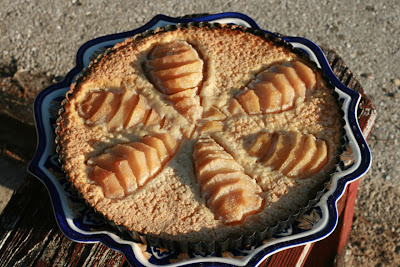 The frangipane can be used immediately or you can store it in the refrigerator for up to 2 days. If it becomes too firm in the fridge, let it sit at room temperature for a while to soften before using. To finish the tart: Preheat the oven to 350 degrees. Spread the frangipane evenly into the cooled tart shell (It should be liquid enough to smooth out on its own). Take the poached pears out of their liquid and drain them on paper towels. You want them dry or they will make the frangipane soggy. Cut each pear half crosswise into 3/8 in thick slices. Do not separate the pear half yet. Slide a spatula or other flat utensil underneath the pear so you can transfer the entire half onto the tart. Press on the pear to fan the slices toward the top narrow end of the pear. Slide the pear half onto the frangipane carefully - you can move the pear after you place it, but not much. Repeat with the other pear halves until there are six halves on the tart, evenly spaced. Before serving, you can brush the pears with some warmed apple jelly to glaze, or dust confectioner's sugar over the tart. Thanks for the link to gel's kitchen!